Brighton & Hove residents reputedly drink more coffee and visit more cafés than anyone elsewhere in the UK. Evidently cafés, café bars and coffee shops play an important role in our lives, as places of refreshment, social venues and work hubs - and this all began centuries ago. With water generally unfit to drink, historically most ordinary people took fluid as ale, beer, mead, cider and milk. However, once coffee, chocolate, tea and sugar were introduced into Europe from distant climes, they transformed drinking habits as westerners developed a liking for hot, sweet, addictive beverages. Coffee beans or ‘coffa’, originally from Kaffa in present-day Ethiopia, were first brought to England by Levantine merchants in the mid-seventeenth century. They were renamed using the Italian word caffé and Britain’s first public coffeehouse opened in Oxford in 1650/51, followed by London’s earliest coffee stall in 1652. Unlike disorderly taverns and alehouses, the new establishments serving invigorating non-alcoholic drinks that restored flagging limbs and sharpened minds prompted lively, civilised social interaction. Becoming the place to discover the latest maritime news, exchange commercial updates and read gazettes and newsletters, particular coffeehouses became linked to certain trades and professions, from sea captains and traders to clergymen, lawyers and politicians, and by 1675 Britain boasted around 3,000 coffeehouses. Most famously, Edward Lloyd’s coffeehouse near London’s Royal Exchange, frequented by merchants and underwriters, was the birthplace of Lloyds of London, the world-famous insurance market. Coffee beans were roasted, ground and boiled, sweetened with sugar and served in a shallow bowl or dish; only much later was hot coffee diluted with milk. Women rarely patronised coffeehouses, although some proprietors and serving staff were female. In London, housewives upset about the amount of time their men folk spent drinking and chatting in coffeehouses drew up a petition in 1674 against ‘Excessive Use of that Newfangled, Abominable, Heathenish Liquor called Coffee’, demanding that they acknowledge their family responsibilities. Men formally responded, spent even more time socialising with their associates and some even had their post redirected to their coffeehouse. In around 1657, tea arrived in England: infused in boiling water and sweetened with sugar, the new drink was also served in dishes in early coffeehouses, but ‘tea house’ culture never developed as did coffee; rather, tea, which did not require roasting and grinding, was easier to prepare at home and eventually developed into a widespread domestic ritual. During the 1700s the English coffeehouse remained fashionable for polite socialising, business and general discussion and reading, although by mid-century it had lost its earlier edge and by the late-Georgian era, many coffeehouses were diversifying, to cater for various classes of patron. Yet, as they became more accessible, some went on to attract artisans, socialists and radical groups who gathered to debate contemporary political and social issues, from agrarian reform to the abolition of slavery. In 1849 journalist, social researcher and reformer, Henry Mayhew reported that many city stalls served hot drinks, bread rolls, sandwiches and cakes to the working poor, a mug of coffee still costing 1d – the same price as in 1650. Victorian Temperance organisations also actively promoted coffee ‘taverns’ or ‘palaces’, buying up public houses for conversion to coffee rooms as alternative, non-alcoholic social venues. In 1884, around 1200 such establishments existed, and yet the golden age of the traditional British coffeehouse was almost over: now enter the cosmopolitan café. Continental coffeehouses had developed a more luxurious, indulgent character, selling coffee, hot chocolate and strong liquors, and our modern idea of the café perhaps originated when in 1865 French wine merchant, Daniel Thévenon, opened a modest London restaurant, the Café-Restaurant Nicols, inspired by the bohemian cafes of Paris. Expanding rapidly, the new establishment evolved into the famous Café Royal on Regent Street, attracting artists and writers including Oscar Wilde and Whistler. Celebrated for its magnificent décor, impressive menu and superior wines, the sophisticated restaurant implanted in Britain the concept of the Continental-style café. Throughout the mid-late Victorian and Edwardian eras genteel cafés were installed in department stores, hotels, museums and galleries and kiosks opened in public parks, at railway stations, sports grounds and other busy locations. As cities grew, high street cafés serving affordable fare in a respectable environment were welcomed by the growing ranks of male and female office, bank and shop workers living in hostels and lodgings without meals provided or cooking facilities. Lyons’ Corner Houses and high street coffee shop chains Cadena and Kardomah became well-known metropolitan venues, while independent cafés were often run by Italian, French, Belgian, Jewish and other European restaurateurs who made a significant contribution to British urban life, introducing local customers to new drinks and dishes. 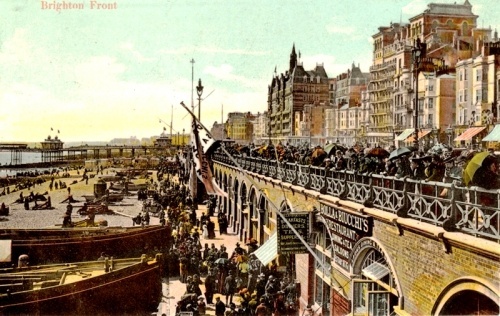 During the later-1800s, as seaside towns expanded, a number of Swiss-Italian immigrants in particular, having first entered London’s catering trade, now progressed to the south coast, establishing cafés and restaurants in Sussex resorts, including Brighton. Later generations also left London, opening Brighton businesses such as Joy’s Café in the Falmer Road in the late-1940s, still remembered today. Some might also recall how the 1950s/1960s café scene reflected the rise of youth culture: British bikers (‘Ton-up Boys’) were also dubbed ‘Coffee-bar Cowboys’ as they hung out in roadside cafes, comparing bikes and staging impromptu races, the Brighton Burn-up and Ride With The Rockers nowadays a major event in the Ace Café calendar. During the 1950s a revival of Continental culture, chiefly modern Italian design also inspired a vogue for sharp Italian suits, buzzing around on Lambrettas or Vespas and drinking espresso in coffee bars - a lifestyle associated with early-1960s Mods. Around the British coast, the seafront café or kiosk has been a familiar sight on esplanades and piers, under arches and beside bandstands for well over a century, offering shelter from unpredictable weather and serving coffee and tea, soft drinks, ice creams, pastries, sandwiches and, naturally, fish and chips. During the Second World War many beachside cafés were closed, but later reopened. Brighton & Hove’s various seafront cafés, with their relaxed atmosphere and scenic views reflect the development of our unique resort over the years, yet still today, along with the city’s more urbane coffee shops and café bars, remain an important facet of local life, very much part of our present.